Danatec’s award-winning, industry recognized WHMIS online training course is for initial or re-certification training. This course meets all of Health Canada’s training requirements under the Hazardous Products Regulations, for all persons involved in handling workplace chemicals. 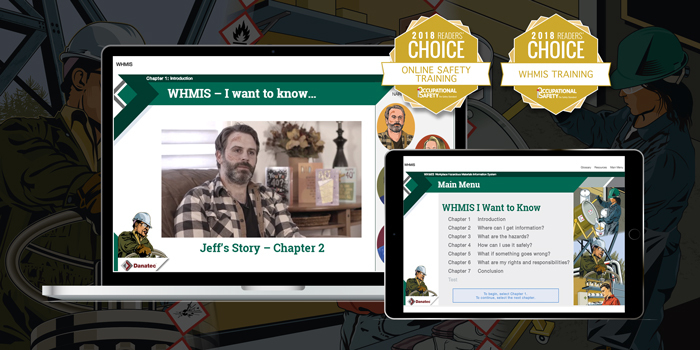 Danatec’s WHMIS online course centres around 5 WHMIS stories, which bring in real life events, told by real people in real workplaces. The video, animations, engaging games and skill building exercises will make for an engaging interactive learning experience. Our course centres on elements that ensure the information is understood, retained and easily resourced. A final exam to complete the course and a printable certificate along with a shareable Digital Badge is issued upon completion. Free printable resources are included such as our WHMIS sample label, poster, sample SDS, glossary and a workplace exercise sheet for additional training. Buying training for your company? Ask about our customizable WHMIS certificates, exams and worksite specific content built to meet your requirements. Please email sales@danatec.com. © First Aid & Safety Training. All rights reserved.